There are many available plants that help to preserve the beauty almost more efficient than expensive cosmetic products. 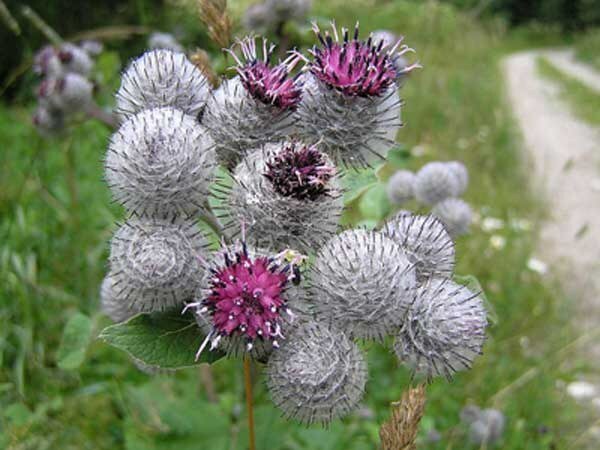 One of the gifts of nature is burdock, which is invaluable especially for hair health. The composition of this oil, which can be easily purchased at the pharmacy at an affordable price, includes vitamins b, PP, A, C, E, and a set of mineral substances, starting from and ending with zinc copper and iron. Also, the oil has a special quality: tannins are present in it, help to get rid of a number of skin problems, and unsaturated fatty acids normalize the metabolism and activity of sebaceous glands. Special mention should be present in the oil, inulin, since it is believed that this substance helps vitamin content is better absorbed by the skin. The range of application of burdock oil is quite wide. It is used in cooking as a filling, helping to compensate for the deficiency of vitamins in the body. Take oil and for medicinal purposes to alleviate the course of diseases of the gastrointestinal tract, but the dosage can be set only doctor. Particularly popular oil in cosmetics. Along with castor, it is part of many masks, and contributes to the strengthening and growth of not only hair, but also eyelashes. To cook burdock oil at home, you need to pour a Cup of vegetable oil 5 table spoons of burdock root, infuse in a warm day and cooking in a water bath for a quarter of an hour with constant stirring. In hair care use of burdock oil has a long history and its effectiveness is tested in practice. It actively nourishes follicles, stimulating hair growth, is struggling with seborrhea, makes the hair shiny, especially on the long tresses. Also normalizes lipid metabolism in the scalp and hair become less greasy, stop itch. You can use it not only as curative but also preventive means for any type of hair, but the course of masks should be long enough. The easiest way to use the beneficial properties of burdock oil for dandruff or as a reinforcing vitamin complex is to RUB it in its pure form in the roots of the heads before every wash, maintaining the hair wrapped in a towel at least an hour. Mask for stimulating hair growth prepared from a mixture of aloe juice with oil in equal proportions. Also rubbed before washing the head. Revitalizing mask for hair that has lost Shine, consists of a tablespoon of butter, the same amount of liquid honey and egg yolk. It must be spread throughout the length of the strands also for half an hour.